CrossFit North Okanagan - Rocking!! During my travels last week from Calgary to Victoria - we made a point of stopping in Vernon to see Garth and Erica at CFNO. Was great to see the facility and meet some of the staff, they have a great thing going. If you live and train near Vernon, check them out, as we know not all boxes are a like. Got to see a newer athlete training with Garth and was impressed at the care that was taken, ensuring the deadlift was executed with perfect form. We love working with Garth, Erica and the Team. Some key Team Infint athletes are competing at the games in Glasgow: Ryan Cochrane, Noelle Montcalm, Melissa Bishop and Julie Labonte. The only one to compete so far has been Ryan, swimming the fastest 400 m Freestyle of his long career to take Gold. Today he qualified fastest in his premier event the 1500 m, he will be swimming in the centre lane for tomorrow's final. Good to see Ryan is still getting faster! Tomorrow Julie competes in Shot Put. Julie is a newer Infinit athlete - we first talked 4 weeks ago, we customized a blend, provided Rescue and Raw for her recovery needs. We were happy to see that she packed it for her Commonwealth journey. Both Noelle and Melissa hit the track later this week in the 400 m hurdles and the 800 m. We are stoked that we have two national champions competing at the games - can't wait to see them in action. Been a pleasure working with two local Windsor athletes that are competing on the world stage. A year into our partnership it has really cool seeing and supporting the various phases of their training. Being able to see them race several times in person and participating in a camp has been a thrill, been really thankful that I have been introduced to the track community, amazing athletes that really do not get the same recognition as some of the other sports in Canada. If you ever get a chance, you should check it out. To put things in perspective, I am doing some track workouts, preparing for a marathon - have got my 800 m repeats down to 3:30, Melissa is running her's in under 2 minutes. Amazing. Wishing all 4 of these athletes all the best over the next week, we are so proud of these Canadians! 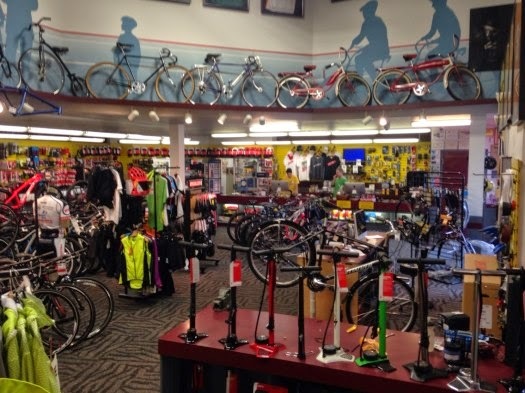 Russ Hay's - The Bicycle Shop Hottest Infinit Retailer!!! First met with Marty and the Team at the beginning of April. This was right around the time they took their first shipment of Infinit. Was in town for the National Swim trials, but while I was there wanted to ensure we took some time to train the staff on the sport specific blends, our New Zealand protein and a bit about our custom process. What was great was that on this Saturday, right at the opening, we had to stop the training several times as there were so many customers in and out. We got through our training and things have been going well ever since. It is a bonus have Curtis Dearden a TeamInfinit athlete working in the store - both for Infinit and Russ Hay's. He can provide valuable feedback to his peers and customers. Whenever a new retailer considers a new product, the big fear is that the product sits on the shelf two years later it gets written off. That hasn't been a worry for any of the 30 new retailers that have come on board since January, especially for Russ Hay's - they have made several orders since their initial in May. It is moving well. With our retail partnerships we offer free shipping once a month to our existing customers. This is win-win as our customers get the product at a lower total cost and Marty and the Team have more folks coming in the store. We are truly blessed to work with some great retailers. Russ Hay's is one of those, a staple in their community, active in the sport and a retailer that offers much more than the products they are selling, they are truly service orientated. Get in a check out what Marty and the Russ Hay's gang has to offer.